If you have seen any MLB games this season you’ve seen a new piece of face guard protection for players. 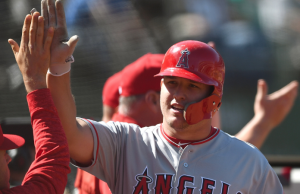 Guys like Mike Trout and Bryce Harper have a new thing on their helmet. It seems like at least half of all hitters are wearing a baseball helmet face guard. There are, roughly, three of these on the market today. More Jaw Guards are on the way. Little League had many manufacturers point out that their helmets aren’t “safe” with a Markwort C-Flap. The USA Today pointed out how dumb this stuff was. Safety gear is not safe because, uh, we can’t sell it to you. Some might argue that MLB or even college level hitters need more protection because they routinely face 95+ mph heaters. This is true. But, they also have the benefit of years of experience, faster reaction times, and pitchers that are throwing from further away. (You may also like our conversation on youth pitcher head protection). Drilling holes in a batting helmet to attach the C-Flap from Markwort will remove the warranty and the batting helmet’s NOCSAE certification. This means, at least in some circles, if an injury occurs due to a helmet failure with a C-Flap attached then there would be no recourse for liability on the company that produced the helmet. Boombah’s face guard does not have this problem as the face guard uses the pre-drilled holes in the helmet. Other companies are working on producing a jaw protection on their youth helmets that are certified. But, as of this writing, there is nothing on the market aside from Boombah. Want to see the Markwort in Action? Do younger players need jaw and face helmet protection? While our young players may not be facing Aroldis Chapman fastballs, if you asked them, it sometimes feels like it. As parents and coaches we enjoy watching our players play and get better. Nothing affects their progress more than a fear of the ball. One easy way to set young minds a little more at ease is to provide them with every available protective tool. The Markwort’s C-Flap does just that and at minimal cost, with easy setup. Does the C-Flap fit on my existing Rawlings, DeMarini, etc. helmet? Boombah claims theirs works best on their Boombah Helmets. On other helmets the certification doesn’t exist. Markwort claims theirs works on most helmets. See our conversation on installing the C-Flap below. Rawlings, Schutt, DeMarini, Slugger and and a host of over serious batting helmets work with the Markwort C-flap. 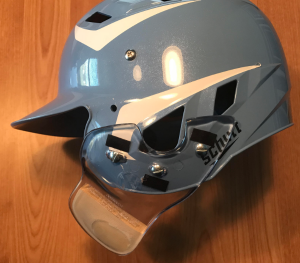 Although Boombah does not suggest it is recommended, we found the Boombah Face Guard to work on a DeMarini helmet with the three screws provided. We use our Boombah version on a Boombah helmet. What is a Markwort C-Flap? The Markwort C-Flap is a piece of padded plastic that attaches to the batting helmet on only 1 side, the side that faces the pitcher when batting. Pro Tip: You’ll need a differently designed one for a left or right handed batter. hangs out over the jaw. Markwort makes no promises that its C-Flap will protect against all facial injuries. But, if worn and used properly should help prevent the majority of facial injuries. Once installed it doesn’t leave enough of a gap for the ball to get between it and the bill of the helmet. Thereby, it also protects the eye without impeding the hitter’s vision. Our test player has used it for 2 practices and 4 games with no complaints. It did not obstruct vision or bothered him. It made him atleast a little more confident at the plate. His teammates thought it was cool. The C-Flap is fairly inexpensive at a cost of about $20 per flap. It is available for both right and left handed hitters. If your player is a switch hitter you could get it for the side he makes the most plate appearances on. Or, install one on 2 different helmets (if that’s an option). Or, possibly, install one on each side of his helmet. We can’t guarantee the last option would work but it does seem that both would fit without impeding vision or the ability to put the helmet on their head. The C-Flap also comes in about 10 different colors which should coordinate with most uniform options. We opted for the clear version since the helmet we installed it on is a Carolina blue and our player did not want white and none of the other colors matched up well. On the clear version you can see the pad that is attached to the lower portion of the C-flap but doesn’t look bad at all. Unless your player has access to a staff of clubhouse attendants like the MLB players, you are probably wondering about installation of the C-Flap. Not to worry, we aren’t exactly experts or handy when it comes to fixing or installing things but this took less than five minutes and only one scraped knuckle. The C-Flap comes with a handy little template you attach to the helmet with tape (our junk drawer swallowed our tape so we just held it in place by hand while we marked the holes). Mark 3 spots that you will drill out with a 7/16″ drill bit. Before you drill you will have to peel back the liner from the helmet and reattach later with double sided tape or something similar. If their is a snap for a chin strap you will most likely have to remove that too, but that proved to be no obstacle for our do-it-yourself prowess (ok, maybe a little, hence the scraped knuckle). Once the liner is peeled back and the 3 holes are drilled it’s as simple as placing the brackets on the inside and attaching the flathead screws from the outside. Their is also tape installed on the flap to help keep it in place and tight to the helmet. The whole process of installation honestly went much smoother than we were anticipating. All necessary hardware is included with the C-Flap. The C-Flap fits most brands of helmets including ABC, Adams, All-Star, Rawlings, Schutt, and more. Ours is a Schutt model with a slightly different shaped ear hole. We covered the ear hole a little. But, it still seems to offer the protection needed and not restrict hearing or air flow. Markwort’s C-Flap is definitely worth the small investment of time and money. The piece of mind of your player and yourself have, and looking like the pros, is plenty worth it. This just adds to the argument that Little League likes to help equipment companies make money. Case in point. Last year’s Easton batting helmet had two screw holes so adding the C-flap required you to drill one hole. This year’s Easton helmet has three holes so you can add a C-flap without drilling a hole. What makes their drilled hole any safer than mine? Its in the same spot and uses the same type of attachment hardware. Here is another lesson for you. Adding material adds strength. The C-flap takes the brunt of the impact, not the helmet. It might break or pull the nut plate through but for that one impact it was great. Hey LL, you didn’t give manufacturers enough money with that crappy bat rule. Now you want to line their pockets on helmets too. I have twin 13 year olds. One that wears the C Flap on a Easton helmet the other does not. The one that does loves to crowed the plate now because of the guards and has seen his strikes drop big time. He has great confidence at the plate now. With the flap being added to the Easton helmet it voided the certification set by NOCSAE. We just ordered the Boombah helmet with the new guard to make his helmet legal for PONY All stars. Thank you for the research. Eric. Thanks for this comment. Having twins puts you in a unique position to do some great side by side research! Ha. That would be fun. Maybe we can borrow them to do some bat testing for us one day. 🙂 Good luck in the All Stars! On the Little League website, there is a letter from Boombah stating their flap, with their helmet, meets the safety requirements. Any league who flat out bans the Boombah version at this point in time is just being flat out lazy. How ironic when you research it all, Rawlings makes the MLB helmets, and also own Markwort. But they are illegal for Little League. Yet, the major manufacturers are coming up with their own products to do the same thing. Tell me someone’s pockets aren’t being lined at the kids expense. Dan, we think you are exactly right. The illegality of these is not a safety issue, but a money issue. The C Flap is really taking off here, but more so in the higher levels like AAA or Majors. Rarely do I see anyone in AA or A wearing these, mostly the full mask. My 12 year old son’s team all bought new helmets this year and the mask made it nearly impossible for him to see based on where one of the bars came across his vision. I made sure and talked to our coaches before doing anything, they have the ultimate say in mask/no mask issue. In the end they ok’d the use of the C Flap and it’s been great. He has been hit in the helmet already and it protected him just fine. I’m really surprised that no one else on the team has switched to one yet. We have come up against full teams with either no mask at all (mostly teams from out of state) or full teams wearing the C Flap (AAA or Majors). Maybe with all of the MLB players wearing the C Flap it will really take over youth baseball or it could be just a fad. I completely understand the pros moving to it, a 90+ mph ball coming at your head is still going to possibly cause a concussion, but better than a broken jaw or losing sight in your eye. I pressed a ball into the C Flap to determine where a ball could enter the helmet and it looks like it would only hit your face if you are looking directly at the pitcher when the ball hits you. Even then, it would nearly need to be overly turned toward the pitcher and I don’t see a kid doing that when they see a ball towards their face. Most often kids turn their back to the pitcher and take it in the back, ouch!! I always tell my kids (3 of them) to take it in the arm while wearing their elbow guard. Either way, Nebraska always seems like 90+ percent of kids are wearing full masks at least until U14 and then they come off for High School. Great insight Jeff. Thanks. We are hopeful others will catch on too. The only issue is that Little Leagues all around will not allow the use of a C-Flap. It’s absolutely ridiculous. We have a Boombah Helmet with the “made for Boombah Helmet” C-Flap and our little league has banned them. I just don’t understand the logic at all. I’m so frustrated that someone has the right to tell my 11 year old what he can and can’t use to protect himself. 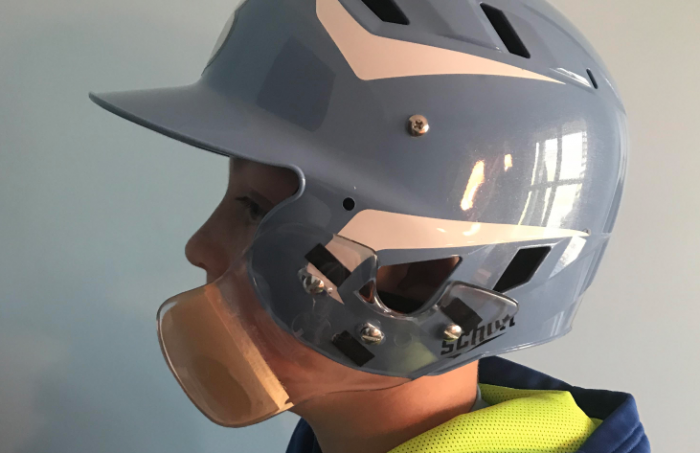 I hope Little league sees that unmodified helmets provide a level of safety to the player that could not only save a jaw, a tooth or an eye, but also a life in some cases. The use of a full face mask is cumbersome, but the C-Flap allows for similar protection. Little League, Please use some common sense. Insurance or no insurance, would you rather have a kids get hit in the face and deal with that insurance claim? My kids use the C-flap. Great product. All young players should use it or something similar . I have the boombah helmet with the guard on my kid. He will not wear a full face mask helmet be cause those are for girls. (although it would offer the most protection) But he was totally into the Boombah helmet with face guard. The helmet and the guards are available in a range of colors. It only takes one wild pitch and this gives some extra protection if he cant get out of the way fast enough. These are a no brainer. Both my kids, 10 and 12, have them. Zero impact on vision and good protection in high end travel ball where kids are bringing it and it only takes one to get away. Also protects the $1000’s we’ve invested in braces. Previous: Previous post: Backspin Tee Reviews | Does It Really Work?